Michael Mizrachi added another title to his list of achievements last night when capturing the WSOP Africa Circuit Main Event at the Emerald Resort & Casino. 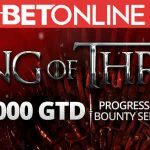 The third World Series of Poker Africa Circuit Main Event produced a thrilling finish after four days of action, and saw one of the most successful poker players in the world add a further $101,000 to his lifetime earnings of over $14 million. Mizrachi´s timing was spot on during the climax to the event, during which he powered himself into contention from a starting position of being fifth (of nine) when play started at the Emerald Resort & Casino in Gauteng, South Africa. Mizrachi belied his nickname of “The Grinder” to make big calls at the right time and eliminate players right from the start. 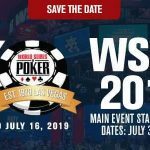 First to depart was inaugural WSOP Africa Main Event winner Warren Zachery (J♣ 7♣), who failed to complete his flush draw on a board of 3♣ 2♣ 4♦ against Mizrachi´s Q♠ Q♣, and then Mizrachi (Q♣ 8♣) made his own flush draw to knock out Eric Brand (A♦ 9♠) in eighth. After the short-stacked Menesh Keshav had seen his pocket Kings crushed by Jarred Soloman´s quad Deuces, Mizrachi stormed into the chip lead. Calling Kenneth Morgan´s (K♦ 10♠) shove, Mizrachi (A♦ 5♥) saw the 2♦ on the river complete his wheel and the field was down to five. The next three eliminations all occurred when players got their chips in the middle with a pocket pair – only to be called by a player with a better pair. Kinesh Pather was eliminated in fifth position when running his 8♦ 8♥ into the J♦ J♥ of Markus “Feurinho” Feurie, and when Jarred Soloman was dealt J♦ J♥, Mizrachi woke up to K♦ K♣. Down to three players, Markus Feurie was first crippled by Karl Myburgh in a A♦ K♠ > K♥ 10♣ race and then lost the remainder of his chips to Michael Mizrachi when running his pocket Fours into Mizrachi´s 10♠ 10♥ – Mizrachi turning his dominant pair into a flush for good measure. After such a spectacular display at the final table, Mizrachi went into the heads-up against Karl Myburgh with a 9-to-1 chip advantage. With such a disadvantage to overcome, it did not take long for the tournament to conclude. Myburgh (A♠ 8♥) got all his chips in the middle on a board of 7♦ 6♦ 10♥ / 7♠ and was called by Mizrachi (Q♦ Q♠). 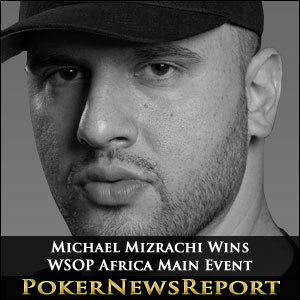 The J♣ on the river was of no benefit to Myburgh, and Michael Mizrachi became the WSOP Africa Main Event Champion – only the second time he has won a tournament outside of the United States! 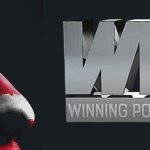 The $3,300 buy-in WSOP Africa Main Event attracted 116 players and generated a prize pool of $337,560 which was shared between the top twelve players. Other than Mizrachi, only one player in the money came from outside of South Africa – third place finisher Markus Feurie (Austria).